XP was released nearly 13 years ago and was the most influential and enduring contemporary operating system. Though I got my start in DOS back in the 80s, I’ve been a Windows man since version 3. I remember my amazement the first time I booted XP. I knew I was using something that would change the world. The only other time I remember thinking that was the first time I held an iPhone. I’m amazed by the commanding grip XP still has on people. 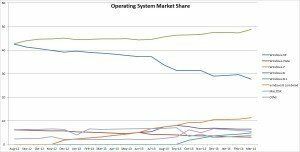 According to NetMarketShare.com, Windows XP still held a 27.69% market share in March 2014 despite being over a decade old. To put that in perspective, Windows XP is currently used on more computers than Windows Vista, Windows 8, Windows 8.1 and Mac OS X COMBINED! Windows XP’s market share poses a couple of interesting questions to the world of computing. Hackers know the EOL is here probably sitting on some serious threats waiting to attack. Nearly 30% of the computers that access the web will be under serious threat overnight. That could have some big ramifications for the computer-using public. Secondly, as people are pushed out of XP where will they go? Will there be a mass exodus from Microsoft with flocks of people bailing to Mac? That has to be causing hundreds of ulcers over at Microsoft right now. Windows 8 just hasn’t taken off like Microsoft expected and it’s really uncertain if people will go from XP to 8. 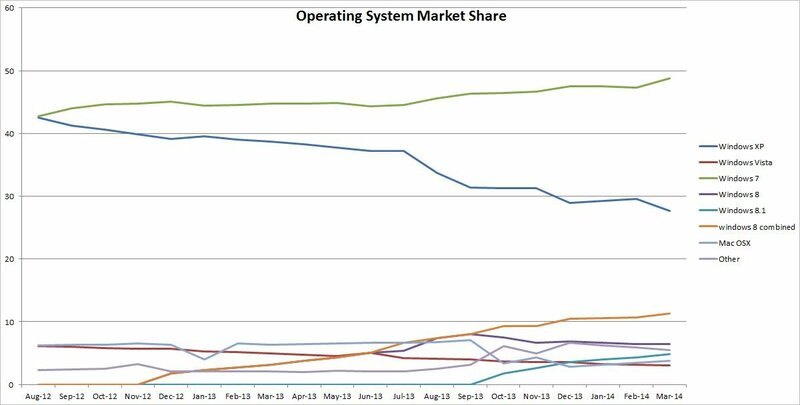 Adoption rates remain low with Windows 8 earning only 11.3% of the market share since its launch in August of 2012. I expect to see a ton of commercials for Windows, Google’s Chromebook, and Mac on TV in the coming months trying to capitalize on all all the people being forced out of XP. XP’s market share has been steadily decreasing for a while now, and has been accelerating since last summer. As you can see in the chart below, XP users are not unanimously adopting Windows 8. In fact, there was a marked drop in share for XP from February to March of this year, and the data says most people left XP for Windows 7 instead of 8. Microsoft must be freaking out. I think there are two big reasons that Windows 8 adoption is so low. 1) We all got burned by Vista. We IT guys spent two years and hundreds of hours fighting that OS and developed a special animosity towards, and suspicion of, new releases of Windows. We’re not going to be caught being early adopters again! 2) Windows 8 removed [surface-level] familiarity that the computing public had grown to love; the start menu. Sure, everything is still accessible in Windows, but to the new user the environment seems cumbersome and things aren’t where they are supposed to be. In response to widespread criticism Microsoft did absolutely nothing until last Wednesday. Microsoft announced their last-ditch attempt to salvage 8’s reputation by replacing the start menu in some future release of the software but gave no release date, just a vague promise. Microsoft also said they would allow modern apps to run in windows within the desktop. DUH MICROSOFT – that’s your system’s namesake, why would you forsake it in favor of a cell-phone like experience?! Bad move! Why did it take you so long to fix? A little pride getting in the way there? Another major factor impeding the adoption of Windows 8 is that Windows 7 is just so dang good. It’s fast, extremely stable, and its familiar experience is a natural landing spot for XP users. I suspect Windows 7 adoption will take off as XP drops – IF users can find Windows 7 machines. I expect to see fewer and fewer new PCs available with Windows 7 as Microsoft tries to push people into 8. That would be a bad move. People have a safe spot under Microsoft’s umbrella right now. If push comes to shove (and Mac lowers prices a bit) Mac might become a serious contender for XP folks. If you have to learn a whole new system, why not learn one that feels a lot like the iPhone in your hands? It’s hard to say how long XP users will cling to their beloved OS before finally giving up and moving on. The entire computing world will be watching where they go.